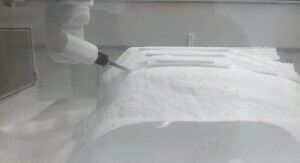 The production of climbing walls may be one of the most unusual applications for Delcam’s PowerMILL CAM system. However, the reason for the choice of software by manufacturer Walltopia was one of the most common; a desire to maximize the productivity of a new five-axis machine tool. Walltopia was founded in Bulgaria by two climbers in 1996 as a manufacturer of artificial climbing walls and climbing holds. Today, the company has completed projects in 42 countries on six continents. In addition to its head office in Bulgaria, Walltopia has offices in the USA, Canada, Austria, UK, Germany, the Netherlands and Russia. Among its customers are gyms, schools, shopping centres, kindergartens, amusement and water parks, recreation and entertainment facilities, hotels, trade centres, and military, police and fire-brigade departments. Innovation has always been, and continues to be, the driving force at Walltopia. The company employs more than 300 professionals in departments covering design, engineering, sales, marketing, accounting, logistics and installation, to support its customers during every stage of the project. They offer not only the largest and most complete range of climbing wall surfaces available in the world today but they also deliver complete solutions for their customers’ facilities and business: from project design to wall assembly, route setting and staff training. All manufacturing is done at Walltopia’s brand new 8,000 sq.m. production facility, the largest climbing factory in the world. 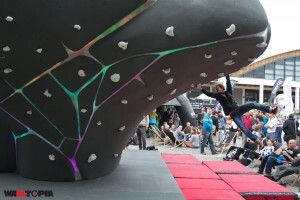 On the site, the company has built some of the world’s largest climbing gyms with climbing surfaces over 2,700 sq.m. Walltopia purchased PowerMILL at the end of May 2012, in order to generate programs for its CMS ARES five-axis milling centre that had been purchased to machine larger parts. After a very short installation period, the full capabilities of the machine could be used. This enabled the manufacture of a new Walltopia product, the Space Boulder, which was launched at the prestigious international Outdoor Show exhibition in July in Friedrichshafen, Germany. As well as allowing Walltopia to use all of the capabilities of five-axis CMS machine, the software makes it possible to automate the production process and shorten the programming time by using templates and macro programming to generate toolpaths. In particular, specialised strategies for disk cutting have boosted productivity by replacing the previous manual approach. Both Walltopia and DiTra were given awards by the President of Bulgaria at the 8th National Innovation Forum, recognising them as being among the most innovative companies in Bulgaria.